Winter is on it’s way. We had our first real weekend of heater and ugg boots weather and the desire for stodgy winter food is rising. I find the perfect combatant to this is to steer towards healthy soup options, because nobody wants to come out the tail end of winter with a couch shaped bottom. I’ve always liked minestrone but never LOVED it. I’d probably prefer a pea and smokey bacon or roast garlic and pumpkin but a few special ingredients really added some oomf to this one and I think I nailed it. Having a freezer full of beef and veal stock made to the Eleven Maddison Park stock recipes probably helps a bucket load. Put a tablespoon of olive oil in a large heavy based soup pot and add potato, carrots, onion, celery, bacon and garlic, cooking on medium/high heat for 7-10 mins, stirring occasionally. Add tomato paste, tinned tomatoes, kidney beans, beef and veal stock and simmer for about 30 mins on low heat.Then about 5 minutes before serving add pasta, basil and oregano, simmering until pasta is cooked. Serve with parsley, grated parmesan and your favourite rustic bread. 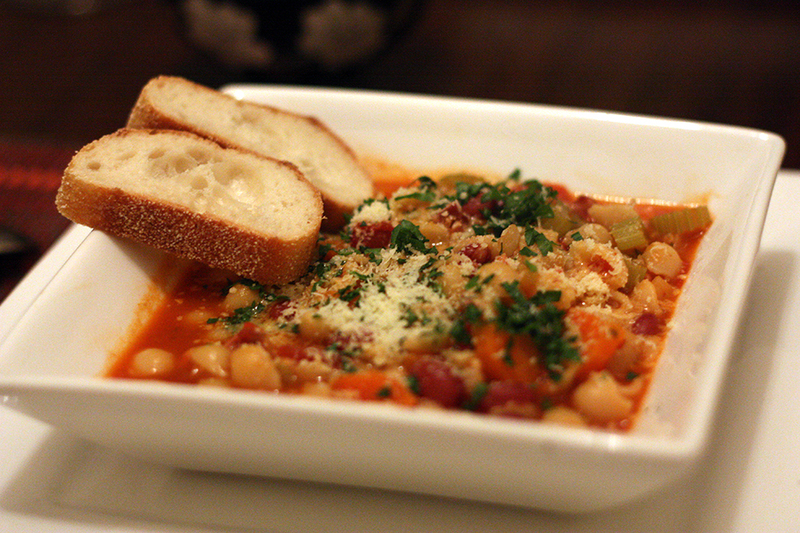 Note: The home made stocks and bacon really took this minestrone up a notch from the usual vege/pasta soup. Previous Post Makin’ bacon, yeah!